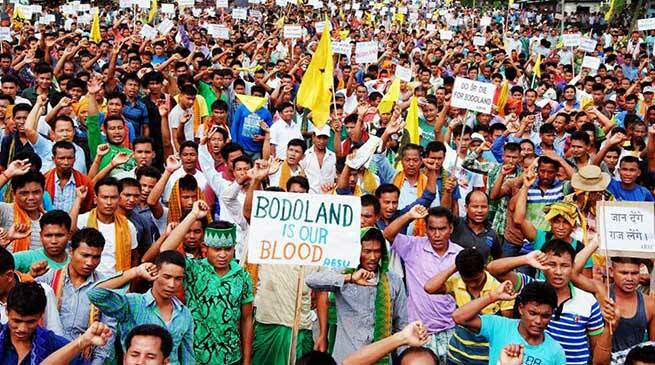 A People’s Grand Rally demanding separate Bodoland organised by ABSU, NDFB(P) & PJACBM from Kashikotra to Kajolgaon Rural Stadium in NH31C, where more than one lakh supporters attended. Talking to Northeastindia24, ABSU president Promod Boro informed that ” from this People’s Rally and Mass Gathering , a Reminder Memorandum to the Prime Minister, Narendra Modi and Home Minister Rajnath Singh of India is sent through the Deputy Commissioner, Chirang and copy to the Chief Minister of Assam is also sent. Further Promod stated that “the present generation is upholding movement for creating Bodoland state under Article 2 & 3 of the Constitution of India. To establish our historical prerogative, to ensure our political and land right, to assert our distinct identity with language and culture and also to eradicate the regional disparity of socio-economic development creation of Bodoland is a must”. “In response to such agitation programs the Government of India held a tripartite talk in political level in New Delhi on the 26th April, 2017. It was the first political level talk of NDA-II Government in centre and we were hopeful that talk would take place regularly as it was assured. But, almost a year have already elapsed after the political level talks still no initiative is taken so far to resolve the issue or resume the talk” Promod added. Promod informed that on 19th of March, 2018 a Grand Mass Rally and Protest Dharna in New Delhi demanding National Policy to create New States in India will be organised. They will also organize a Indefinite Hunger Strike in the month of April 2018 and indefinite National Highway and Railway Blockade from May 2018, after that Indefinite Economic Blockade June 2018.